Status: Inactive; Active 1970-1987. Born: 1945-08-31. Spaceflights: 3 . Total time in space: 200.61 days. Birth Place: Aleksandrya, Kirovograd. Graduated from Higher Air Force School Chernigov, with a degree in electrical engineering, 1968. Graduated from Gagarin Military Academy, Monino, 1976. Graduated from Military General Staff Academy, Moscow, 1989. Call sign: Dnepr (Dnieper). Worked in the General Staff of the Air Forces within the Ministry of Defense. Resigned from active duty in 1995. Family: Cosmonaut. Country: Ukraine. Spacecraft: Salyut 6, Salyut 7. Flights: Soyuz 22, Soyuz 32, Soyuz 35, Soyuz 37, Soyuz 40, Soyuz T-5, Soyuz T-7, Soyuz T-13 EO-4-a, Soyuz T-13 EO-4-b. Projects: ASTP. Agency: VVS. Bibliography: 4452, 5904. 1945 August 31 - . Birth of Leonid Ivanovich Popov - . Nation: Ukraine. Related Persons: Popov. 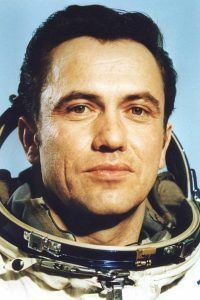 Ukrainian pilot cosmonaut 1970-1987. 3 spaceflights, 200.6 days in space. Flew to orbit on Soyuz 35 (1980), Soyuz 40, Soyuz T-7..
1976 September 15 - . 09:48 GMT - . Launch Site: Baikonur. Launch Complex: Baikonur LC1. LV Family: R-7. Launch Vehicle: Soyuz-U. Soyuz 22 - . Call Sign: Yastreb (Hawk ). Crew: Aksyonov, Bykovsky. Backup Crew: Malyshev, Strekalov. Support Crew: Andreyev, Popov. Payload: Soyuz ASTP s/n 74 modified with MF6 camera. Mass: 6,510 kg (14,350 lb). Nation: Russia. Agency: MOM. Program: ASTP. Class: Manned. Type: Manned spacecraft. Flight: Soyuz 22. Spacecraft Bus: Soyuz. Spacecraft: Soyuz 7K-MF6. Duration: 7.91 days. Decay Date: 1976-09-23 . USAF Sat Cat: 9421 . COSPAR: 1976-093A. Apogee: 296 km (183 mi). Perigee: 185 km (114 mi). Inclination: 64.80 deg. Period: 89.30 min. Surplus Soyuz ASTP spacecraft modified with a multi-spectral camera manufactured by Carl Zeiss-Jena in place of the universal docking apparatus. Eight days were spent photographing the earth. Tested and perfected scientific-technical methods and devices for studying the geological characteristics of the earth's surface from outer space for economic purposes. 1981 May 14 - . 17:16 GMT - . Launch Site: Baikonur. Launch Complex: Baikonur LC1. LV Family: R-7. Launch Vehicle: Soyuz-U. Soyuz 40 - . Call Sign: Dnepr (Dnieper ). Crew: Popov, Prunariu. Backup Crew: Dediu, Romanenko. Payload: Soyuz 7K-T s/n 56. Mass: 6,800 kg (14,900 lb). Nation: Russia. Agency: MOM. Program: Salyut 6. Class: Manned. Type: Manned spacecraft. Flight: Soyuz 40, Soyuz T-4. Spacecraft Bus: Soyuz. Spacecraft: Soyuz 7K-T. Duration: 7.86 days. Decay Date: 1981-05-22 . USAF Sat Cat: 12454 . COSPAR: 1981-042A. Apogee: 270 km (160 mi). Perigee: 192 km (119 mi). Inclination: 51.60 deg. Period: 89.10 min. Manned two crew. Docked with Salyut 6. 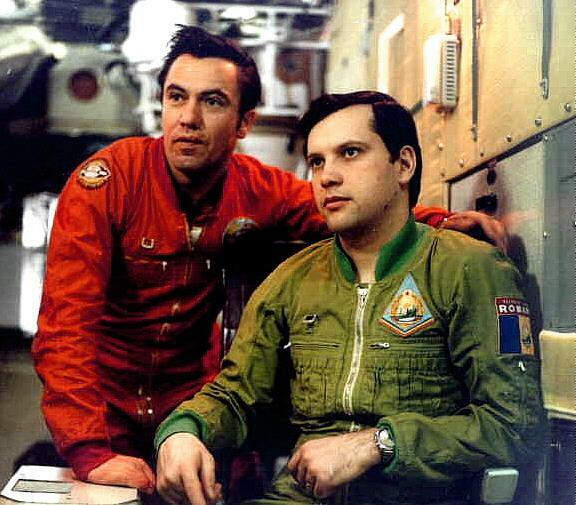 Transported to the Salyut-6 orbital station the ninth international crew under the INTERCOSMOS programme, comprising L I Popov (USSR), and D. Prunariu (Romania), to conduct scientific research and experiments..
1981 May 22 - . Landing of Soyuz 40 - . Return Crew: Popov, Prunariu. Nation: Russia. Related Persons: Popov, Prunariu. Program: Salyut 6. Flight: Soyuz 40, Soyuz T-4. Soyuz 40 landed at 13:58 GMT. .
1982 August 19 - . 17:11 GMT - . Launch Site: Baikonur. Launch Complex: Baikonur LC1. LV Family: R-7. Launch Vehicle: Soyuz-U. Soyuz T-7 - . Call Sign: Dnepr (Dnieper ). Crew: Popov, Savitskaya, Serebrov. Backup Crew: Pronina, Romanenko, Savinykh. Payload: Soyuz T s/n 12L. Mass: 6,850 kg (15,100 lb). Nation: Russia. Agency: MOM. Program: Salyut 7. Class: Manned. Type: Manned spacecraft. Flight: Soyuz T-5, Soyuz T-7. Spacecraft Bus: Soyuz. Spacecraft: Soyuz T. Duration: 113.08 days. Decay Date: 1982-12-10 . USAF Sat Cat: 13425 . COSPAR: 1982-080A. Apogee: 299 km (185 mi). Perigee: 289 km (179 mi). Inclination: 51.60 deg. Period: 90.30 min. Docked with Salyut 7. Carried Svetlana Savitskaya, Leonid Popov, Alexander Serebrov to Salyut 7 to conduct scientific and technical research and experiments..
1982 August 27 - . Landing of Soyuz T-5 - . Return Crew: Popov, Savitskaya, Serebrov. Nation: Russia. Related Persons: Popov, Savitskaya, Serebrov. Program: Salyut 7. Flight: Soyuz T-5, Soyuz T-7. Soyuz T-5 landed at 15:04 GMT with the crew of Popov, Savitskaya and Serebrov aboard..